I realized it has been over a year since I posted a blog post, so I thought I better update! I can’t believe A Tail Waggin’ Good Time is now in it’s 6th year of business! That’s amazing! We’ve loved caring for your animals over all of these years! Things have certainly changed since I first began the business. For one, I now have a toddler and am also expecting baby #2 in just a few months! I have amazing help that keeps things going though and am not sure what I’d do without them. Most of our business consists of mid-day weekly visits for some very loyal clients. Once in a while, we do have an opening or two for a new client though so don’t hesitate to contact us just to check. I’ve just updated the 2014 rates for a all new clients or future pet sits booked this year and beyond. Rate increases will not affect our regular/current mid-day clients. Well hello old blog. I’ve def. neglected posting here and here it is the end of MARCH! Oh my! This year is going by so fast. It’s the season of moving I guess b/c 2 of my very long time clients(since 08-the beginning of ATWGT time) are moving away and that means we have a midday opening! ATWGT is now accepting a midday walk and/or pop in for Monday-Friday in the west ashley area of Charleston. The opening can be any day of the week and certainly doesn’t have to be every day. You can do m,w,f or just T, Th. Your choice, but contact us to get on our regular schedule! Hope everyone has a wonderful warm spring! Another year has gone and A Tail Waggin’ Good Time is about to turn 5! With this new year, there’s going to be some changes at ATWGT. With the launch of my photography business and being a mom with a husband who’s job as a police officer is unpredictable, it’s become very hard for me to do pet sits that involve early mornings, evenings, and weekends. I’ve decided to start only taking on new clients that have cats that only need 1 visit per day. This way the visits can be flexible and done during the day rather than late at night when it’s time for my son to go to bed. I’ve also decided to limit my visit area to west ashley only. If you live off of bees ferry road, you get a discounted rate. All WA areas between downtown and 526 will be the regular rate. In addition, I’ve decided that next Christmas and Thanksgiving, I can only accept cat visits that are the same as above. One visit per day during the day. Family is so important and getting to enjoy the holidays and time with my own family is hard to do with a full load of pet sits on my plate too. I have loved visiting your pets over the holidays, but it’s time to slow it down a bit and focus on what is the most important to me. To all ATWGT regulars and daily visits, thank you for supporting and trusting ATWGT with your precious pets and I look forward to another year of visiting them while you’re away or at work! Wow, it’s been a while since I posted. It got cold, it’s November and we are quickly approaching the busy season! I can’t believe it’s already November!! I wanted to do this post and have it on my front page of the website for anyone who is interested in booking for Thanksgiving and Christmas this year. We were only able to take a very limited # of pet sits this year for thanksgiving and Christmas. We are totally booked up for Thanksgiving! There are a limited amount of spaces available over the holidays for cat clients needing just one visit per day. We cut back this year to avoid being overwhelmed. Just like you, we want to spend time with our families over these very important holidays. We also want to make sure that we are there for our loyalist clients who book not only at holidays, but all throughout the year. Thank you for your continued support and trusting ATWGT with your beloved pets! Posting today to let you know that I’m having a HUGE, once in a blue moon SUPER SALE on some of my already made dog t-shirts! I’ve listed some already on etsy and will be listing more this week. They are only $5!! I’ve never done a sale like this before & prob won’t again so take advantage. In other news…I’ll soon be coming up with special rates for residents living in the Boltons Landing neighborhood of West Ashley. Pretty soon(a few weeks away) I”ll be your neighbor and I would love to meet more furry friends in the community. Blog post on this to come, but I want to go ahead and mention that for the holidays this year, bookings will be VERY limited!! This inlcudes thanksgiving and Christmas. You must book EARLY this year if you want to reserve your space and once I’ve reached my capacity for the holidays, I won’t be able to accept any more bookings. I’m only accepting existing clients over the holidays and a non refundable deposit of half of your total is due to reserve your space. Happy September! Fall is coming!! SUMMER! yes, boy is it summer! It’s HOT, june is almost over, and we are in hurricane season! Yikes! I just thought I’d do a little post today b/c it’s been a while. We are still at it, visiting your fur kids, staying busy, and gearing up for the holiday coming up! Yep, Independence day is coming, do you have your reservations for your furry pals? I hope so! “We could just live our normal, day-to-day lives, saving all the good living up for someday, but I think today, just plain today is worth it….When I live purposefully and well, when I dance instead of sitting it out, when I let myself laugh hard, when I wear my favorite shoes on a regular Tuesday, that regular Tuesday is better”…. Have a great rest of the summer and don’t delay when booking care for your precious pets! Remember, A Tail Waggin’ Good Time, because your pets deserve it!! I hope everyone had an enjoyable memorial day weekend with friends and family and maybe some juicy burgers on the grill! It’s officially summer!! Heat, sunshine(sunblock), hurricanes, long days, breezes…. It’s great! I started the dog accessory side of this business in Oct of 2008 and it began with dog t-shirts that I hand printed. That turned into message collars and eventually ribbon collars. Turns out, ribbon collars are my best sellers and the t-shirts have been neglected a bit. I LOVE doing them and customizing them for people, but I don’t sell enough of them to continue to purchase the inks, papers, etc. It really is a huge process, especially for the message collars. As sad as I am to to announce this, I am going to put the message items on hold for a little while. This is hopefully only temporary and I will still sell the ones that I have that are already pressed. This just means, no more custom printed collars unless you want to pay big bucks for them! :). I have high hopes for this new venture and I want to make sure I don’t overwhelm myself with too much. I’ll admit when I get an order for a message collar lately, I don’t get excited anymore. I think about the long process of designing the template (if it’s a new one), printing it out and making sure it printed just right, cutting it out plus the ribbon, heating up the press machine, then starting the collar sewing process. It’s quite a bit of steps as you can see and getting harder and harder to devote the time to. I believe I’m long overdue for a post!! Hope you’re having a great saturday! We are a bit slow this weekend on the pet sitting side, but have a few cat sits on the schedule and an event tomorrow! I hope you’ll all consider coming out to Parks & Paws tomorrow at St. Andrews Park on Playground Road. It’s from 11-2. There will be lots of cool things happening and I’ll be there with my dog collars and t-shirts!! 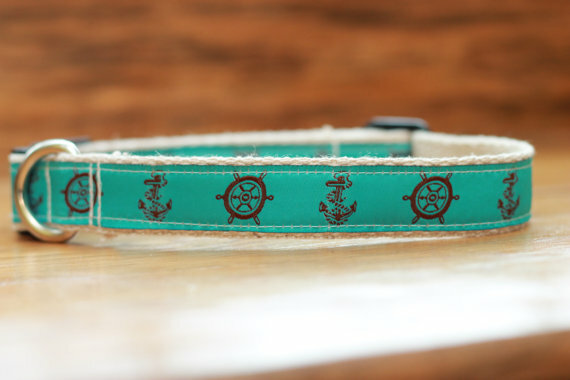 If you’re in the market for a new collar for your furry pal, look no further! I’ve got lots of great designs to choose from and you can shop HERE! 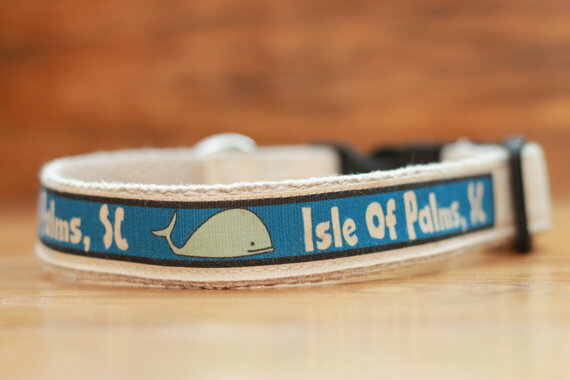 Each collar is made right here in Charleston by me! GO LOCAL!!! 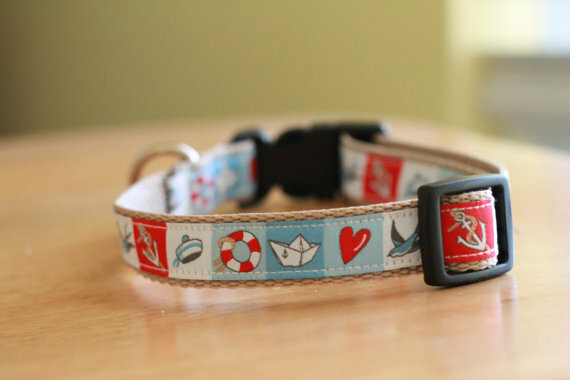 I hand sew them all and make sure they are super duper sturdy for your furry pals! Lots of my ribbons are beach themed and/or will remind you of the lowcountry. I also make super cute custom message collars! I have lots of phrases to choose from or you can create your own! You can get any of these phrases on a collar or dog t-shirt! Below are some photos of the collars I make. Make sure you go check them all out in my etsy shop! I’ll do a whole post about this soon, but the 3rd collar pictured below will be featured in CITY DOG MAGAZINE! Pretty cool huh? They contacted me recently to feature it in their cool products section for Spring 2012, so be on the lookout! As soon as I have a pdf to show it to you in print, I’ll be sure to post it! I hope to make some for you soon! Now go enjoy this beautiful Charleston Weekend! I can’t believe it’s time to post this, but it has been FOUR whole years this month that A Tail Waggin’ Good Time opened it’s doors for business. It just makes me so happy to say that! I can still remember my very first consultation and being so nervous, but feeling so giddy afterwards knowing that it was truly officially starting! With my business magnet on my little honda civic, I cruised ALL OVER Charleston doing pet sits everywhere I could! I quickly learned that I was NOT super woman and I could not cover all of Charleston by myself, even in that honda civic. A few years later, a little boy added to my life, and help hired, I’m still at it, just with some wonderful help to pick up some of the load. My helper Amy has been with me since August of 2010 and I’ve never had such great help! She is always available and ready to fill up her schedule with wet kisses and wagging tails! I’m so thankful for her. Nikki is also a new addition and was actually a previous client! I always said old clients would make some of the best help b/c for one, they’re already animal lovers, right? So thank you clients for helping A Tail Waggin’ Good Time to keep on truckin’! We love to visit your pets everyday and while you’re getting some time away on vacation and we look forward to many more years serving you. Here we go year five! Let it begin!